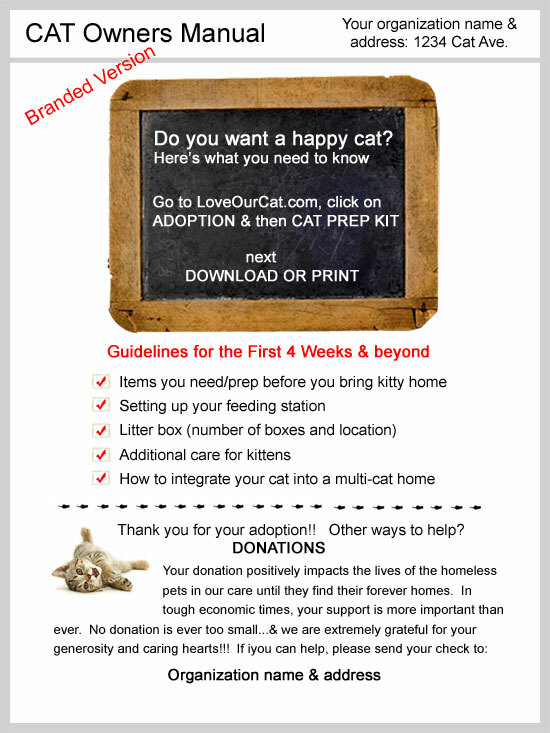 The Shelter Cats Adoption page was developed for Shelters and any type of CAT Adoption or CAT Rescue Organization in an effort to give you another tool in your kitty tool belt. You do the most amazing work, helping some of the most vulnerable in our world find love and a home. So here's the idea of what we hope to accomplish. A person wants to adopt a cat. The person answers a lot of important questions to make sure they are a match. If the person checks out, the person leaves the shelter with new kitty, starter pack of food and a few extra goodies. We hope that you also include one of our brochures to help new cat owners create a smoother integration for Mr. Cat and a greater understanding of small details that make a big difference for a less stressful and happier kitty home. It's our goal to help newly adopted cats and kittens integrate into their new homes. People usually have the best intentions but think owning a cat is a piece of cake. But there's a lot more to it than a bowl of food, water, and a litter box. and a few toys. In our experience, most adoptions that don't have a happy ending are either litter box issues, furniture issues, stress issues or an integration problem into a multi-cat family. We hope our site will take new cat parents to school and give them information that is helpful.